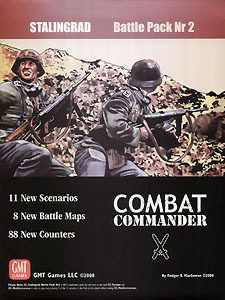 Combat Commander Stalingrad Battle Pack Nr 2 is the second themed collection scenarios for use with the Combat Commander Series of games. This Battle Pack shifts to the Eastern Front in late 1942 as German and Russian forces clash in and around the vaunted city of Stalingrad. CC: Stalingrad features 11 new scenarios printed on cardstock - one of which is a new style of multi-scenario Campaign Game - as well as 8 new maps and 88 new counters. Numerous additional rules and counters relevant to the dense urban fighting characteristic of the struggle for Stalingrad are included, such as: Factories, Urban Snipers, Ongoing Melee, Rubble, Debris & Craters, Underground Sewer Movement, and the Ampulomet Molotov Launcher. Please Note: CC:Stalingrad Battle Pack Nr 2 is NOT a stand-alone game. You will need to own both CC: Europe and CC: Mediterranean in order to play every scenario; 7 of the 11 scenarios in the Pack can be played without owning CC: Mediterranean.